THERE is a lot more to France than popular tourist attractions such as the Eiffel Tower and the Louvre. There’s the royal chateaux in the Loire region, Premier Cru vineyards in Burgundy and the Pope’s Palace in Provence. 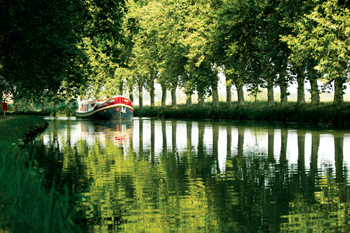 “One of the most beautiful ways to experience the finest things in France is to take a cruise on one of its many canals and rivers,” says James Newcombe, publisher at www.french-waterways.com, an authoritative source of information on France’s waterways. Some of the most famous canals wind through the gorgeous wine-making areas of Sancerre, Chablis and Cotes du Rhone, while the historic 17th century Canal du Midi links the Mediterranean to the Atlantic through a 360-km network of waterways. Hotel barges are large flat-bottomed boats converted into luxurious private floating hotels. They typically carry only eight to 12 guests, and some as few as four, so they can be chartered privately for an exclusive experience. Hotel barges travel slowly, giving guests an up, close and intimate feel for French life and culture, and travel a short distance each day, docking at a new mooring each evening. Guest accommodation is luxurious and spacious, some providing dressing rooms, baths and four-poster beds. All are fitted with air-conditioning and modern wi-fi communications and some will even provide private telephones and TVs. Fleur de Lys, from the fleet run by Belmond, is one of the most luxurious barges on the waters of Europe and is regularly chartered by celebrities and dignitaries. It features its own private pool, grand piano and three extremely spacious suites, each with a separate dressing area and bathroom featuring twin sinks and power showers. The Golden Odyssey, a private hotel barge operated by an expert husband-and-wife team, is decorated in a sumptuous manner. The wood-panelled salon is furnished with Persian rugs, antique furniture and an open fire. It has an impressive teak sun-deck and a temperature-controlled spa pool. Hotel barge chefs are highly qualified and experienced and love the opportunity to prepare Cordon Bleu quality food, from tasty breakfasts of fresh croissant pastries and seasonal fruit, to tempting hors d’oeuvres, right through to five course fine dining menus – all accompanied by the best of local wines. Indeed, the abundance of fresh local produce is what tempted Rick Stein, world famous award-winning chef, to pick a hotel barge cruise as the setting for his memorable TV series, ‘French Odyssey’. While hotel barge cruises offer an unparalleled opportunity to get away from the hustle and bustle of life, there’s also no fear of boredom. If guests don’t feel like sitting back and basking in the beauty of the slowly passing countryside, there’s a range of all-inclusive activities, from wine-tasting to visiting ancient chateaux, from guided city walks to tours of monasteries. All hotel barges have bicycles on board and most barges have an executive mini-bus travelling alongside devoted to providing fascinating excursions. The crew can also organise additional special activities, like hot air ballooning, horse riding and golfing. While the luxury and the slow pace of barges are very attractive, what really sets them apart from other types of cruise is the top-class personal service on board. In many cases, there is one crew member for every two guests. Hotel barge teams invariably speak English and are used to catering for many international cultures. Although every little nook and corner of France has marvellous stories to divulge, there are some waterways that are more loved than others: cruises through Paris and Champagne, Burgundy, Provence, the Loire, Aquitaine and Bordeaux. The Canal du Midi (a Unesco World Heritage site) is a big favourite for its stunning beauty and magnificent architecture. Belmond’s Alouette sails on the Midi from Béziers to Carcassonne in the sun-drenched Languedoc region, France’s most productive wine area.